Set in an alternate 1970s, J. G. Ballard’s novel depicts the gradual descent into savagery of the occupants of a new tower block, as the building shuts down around them. As adapted by fast-rising British director Wheatley (Sightseers, A Field in England) and screenwriter Amy Jump – with a score by Clint Mansell, and an Abba cover by Portishead – this is a gripping spectacle, where humour and violence go hand in hand. 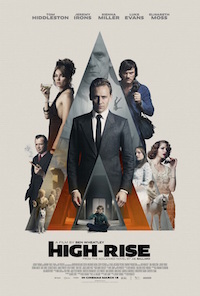 Recommended equally for admirers of Ballard’s writing, Wheatley’s films, and Tom Hiddleston!